A marketing survey from Orange has inadvertently revealed an as-yet-announced handset from the network – the Orange London. Now, this is the first time we have heard of the moniker Orange London. We have already heard word about a BlackBerry London but Orange London is a new one on us. According to Simon Hardy, who took the survey and in turn unlocked they key to details of the Orange London, the phone was introduced to him after answering a few questions to do with Orange's Better Together scheme. 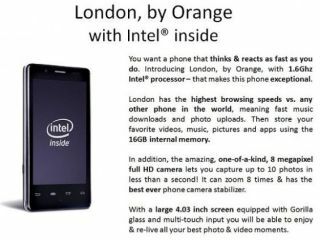 According to the page that appeared, Orange London specs appear to be a 1.6Ghz Intel processor, 8MP camera, a large 4.03-inch screen and 16GB internal memory. The Orange London is also said to have the "highest browsing speeds vs and other phone in the world" which would make it a 4G phone. There's also the intriguing addition of a fast camera, which can shoot off 10 shots per second. With MWC 2012 just days away, it won't be long until we find out if the Orange London is real, or just a dream phone conjured up by marketing bods at the colourful network.